I’m back from a very restful holiday to Southern California and a night sky photography workshop at Joshua Tree National Park last weekend. I’ll have some photos and stories to share from that in the coming weeks, but for now I wanted to get back to my topic of the month, reviewing how On1 Photo Raw, Luminar and Topaz Studio compare in editing images with different issues. The last post focused on high ISO, noisy images, and today I wanted to look at landscape images, and see how the different programs deal with removing sensor spots and other distractions. I’m using images from my last trip to Southern Africa, as I was using the Nikon D610 on that trip, and that camera collected sensor dust very quickly. I had the sensor professionally cleaned prior to my trip, and without ever changing the lens, by the end of 4 weeks, I was having spots show up at f8. The images can be a bit frustrating to edit with so much gunk to remove, but they are great for putting different software to the test. The first image was edited using Topaz Studio. There were only a few spots to deal with, since this was shot at 1/250sec, f5.6, ISO 2000. My camera really wasn’t set for shooting landscapes; I had been taking photos of animals prior and saw this scene and quickly composed and shot on the go (I don’t think the vehicle even stopped for this). It was a chilly, misty morning when I shot this on the last day of my South African trip last year. I am happy with the spot removal from Topaz, and really like that the pockets of fog in the distant hills show up very much as I remember the morning. Next up was Luminar, and I anticipated issues based on my previous use of the erase function. This is the unedited image; I didn’t hold back and sent one of the worst (for sensor spots) sunrise images I had over to Luminar to see how it would manage. I first tried using the erase function, and it left larger, yet fainter circles everywhere I clicked trying to remove the sensor spots. It’s a bit tough to see at this size, but the results are very disappointing (note no other edits were done to this version, other than the attempt at spot removal). Thankfully, the Luminar clone and stamp tool works very well; so if I had one bit of advice to give, don’t waste your time trying to use the eraser tool, and go straight to clone and stamp for any spots or distractions in your images. Using the clone and stamp tool effectively cleaned up all the sensor spots and the software was great for bringing out the beautiful tones to this sunrise image, without it ending up looking oversaturated. Last, but not least, is an image edited using On1. 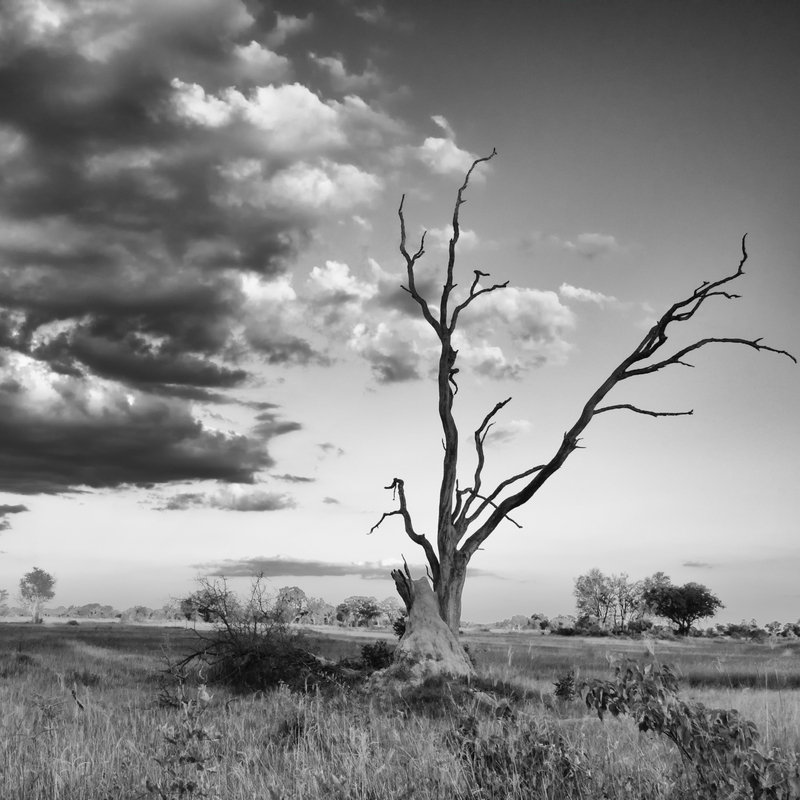 I shot this image in the early morning on Ngala Private Game Reserve, just after a storm passed by. We had a beautiful sunrise, huge cloud banks, a couple of rainbows… I didn’t really know where to point my camera! I’m really happy with the way On1 dealt with the sensor spots; there was a little bit of noise / graininess in the clouds that I also worked to balance out. 1/250 sec, f8, ISO 500. I’m going to call it a draw on this one. Each program dealt effectively with the limited amounts of noise in the images, and was able to deal with sensor spots and other distractions effectively. I was able to get results in On1 the fastest, but even with the huge number of spots to deal with in the Luminar image, I didn’t spend more than 5 minutes start to finish editing any of these images. I hope you’ve enjoyed my selections for the day; check back next week as I look at editing images of our feathered friends.